Red Dead Redemption 2 may be killing it at the moment – and rightly so, it’s fantastic – but Rockstar aren’t the only ones getting in on the old frontier. Ralph Lauren, the preppiest of the preppy has released their American Western collection and with it a pocket watch fit for Arthur Morgan himself. 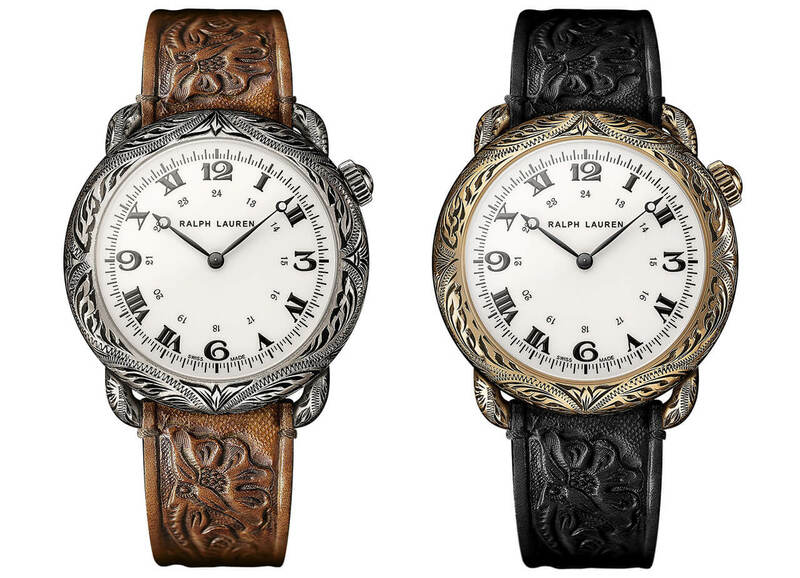 Marking Ralph Lauren’s 50th birthday, the new collection comprises eight watches in total. The entry level Western Cushion is a 40’s-inspired cushion watch housed in a 42mm case available in either rose gold or sterling silver. The hand-painted white dial paired with a combination of Roman and Arabic numerals and Breguet style hands helps conjure a distinctly antique American vibe. 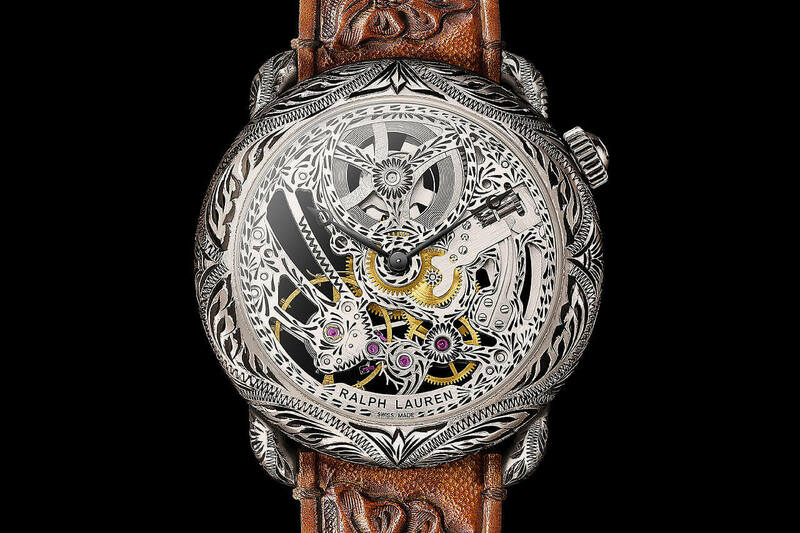 Inside the case, Ralph Lauren’s ties to the Richemont group are revealed with a Piaget made Caliber RL514 boasting a 40-hour power reserve and a balance frequency of 21,600 vph. The Western Round models utilise the same movement as the cushion version but apart from the obvious case shape difference they are very much the same. The same can’t be said of the skeletonised Western Round however which is altogether a different beast. Sporting an open-worked, modified Caliber RL1967 developed by IWC, the watch takes the engraving to the next level bringing the heady hand engraving to the baseplate and main bridges. 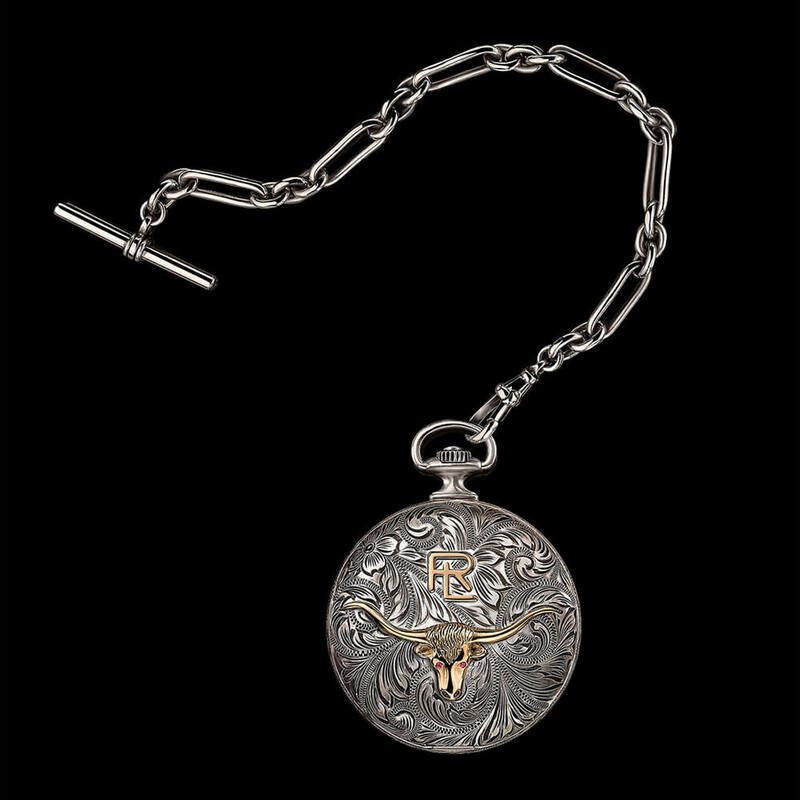 Ralph Lauren RL Western Pocket Watch Engraving Sterling Silver 50mmThe undisputed (lone) star of the collection however is the full hunter pocket watch. At 50mm it’s small for a vintage pocket watch but still heft. A good part of that is thanks to the sterling silver case, of which there’s not an inch left to its own devices. To cap it off, the case back is embellished with the RL logo and a golden bull, ten commandments be damned. 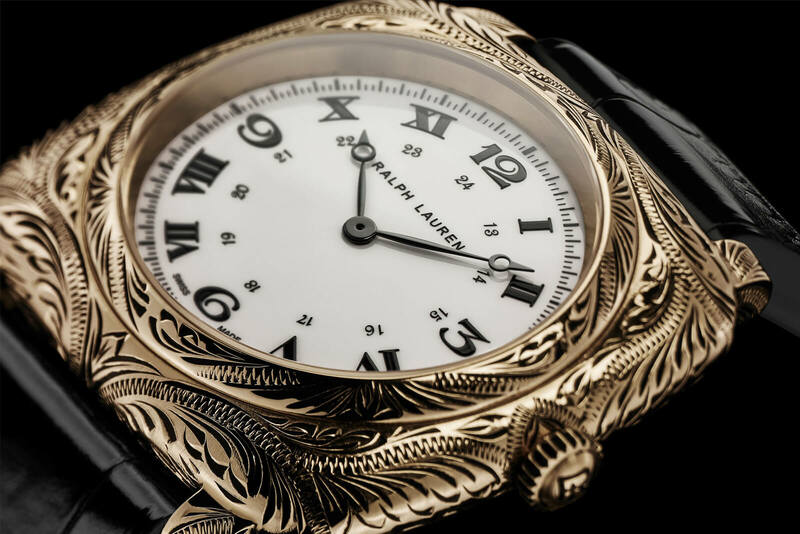 The dial side has the feel of an old town clock to it, except that it combines both Arabic and Roman numerals. Not like a California dial though but switching from number to number. It shouldn’t work but it damn well does. In fact, not much of this watch should work on paper. It’s a design that would John Wayne would have asked to tone down. Inside is Ralph Lauren’s own RL 98295 calibre – essentially an IWC Portuguiser adapted to its new case. It’s reliable and, more importantly, beautiful, as seen when you flip open the hunter case back. Maybe it’s my renewed love for all things Western or maybe it’s just the flawless execution and finishing of the pocket watch, but I can’t help but need one in my life. Preferably with an old-school waistcoat. And a Stetson. 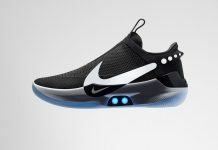 Still, with only 50 available you’d best hope you’re quick on the draw. Share the post "Ralph Lauren Head West with “American Western” Collection"